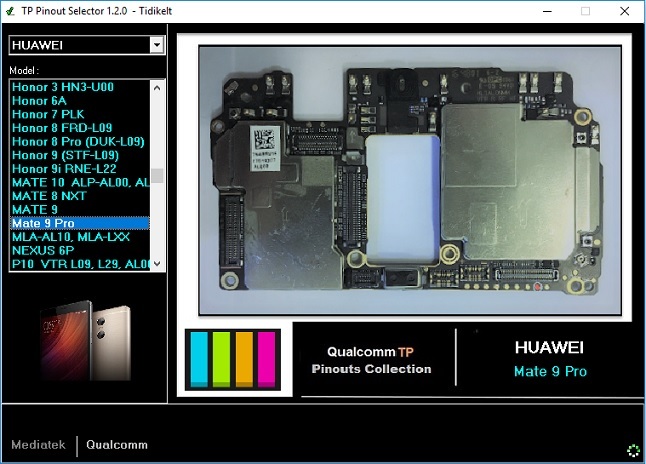 Test Point Pinout Tool 1.2 is a small application for Windows Computer which Allows you to check out the Test Point pin for more than 200 models (Based on MTk & Qualcomm chipset) Xiaomi Alcatel,Condor,Doogee ,Iris Sat ,Lenovo,Qmobile,Samsung Clone ,Tecno,Wiko,Zte,Qualcomm ,Huawei,Lg. Credits: Xiaomi Redmi EDL Pinout Finder is created and distributed by Tidikelt GSM. So, full credits goes to Tidikelt GSM Team for sharing the tool for free.